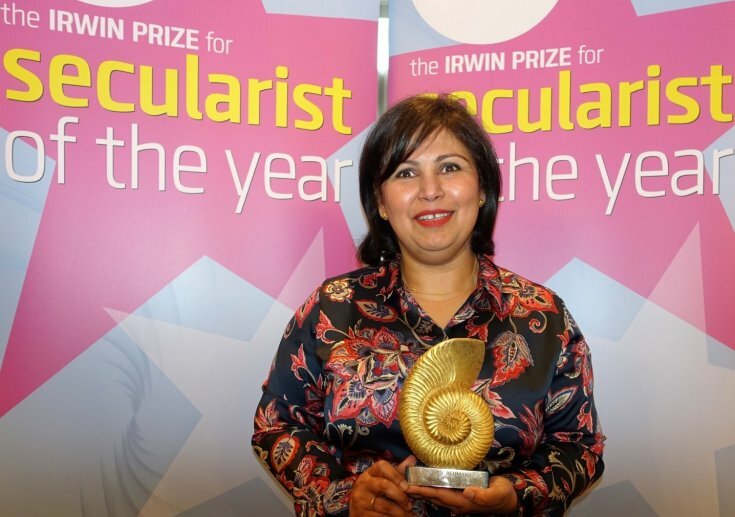 The Irwin Prize for Secularist of the Year 2017 has been awarded to Yasmin Rehman, the secular campaigner for women's rights. Yasmin has spent much of the past two years working to get the Government to recognise the dangers faced by ex-Muslims and Ahmadi Muslims from Islamic extremists. She has used her own home as a shelter for women at risk of domestic abuse. Accepting the prize, Yasmin Rehman thanked the Society for recognising her work and said she was "incredibly humbled" to be nominated among other figures who were "personal heroines." She said there were two women, Maryam Namazie and Gita Sahgal, whom she couldn't have campaigned without, and that she was "honoured" to stand beside them. Secularism was not opposed to faith, she said, before describing how she had been shut down as 'Islamophobic' and "racist" despite being a Muslim herself. There is anti-Muslim sentiment in society, she said, but charges of 'Islamophobia' were being used to silence and curtail speech. Yasmin said she didn't know if she could ever go back to Pakistan because of her work, while in the UK it was "impossible" to get funding for secularist work. She asked where women could possibly turn if they faced religiously-justified abuse. Muslim women were left with nothing but religious, sharia arbitration, while faith healing was spreading with ill women being controlled by male relatives and religious leaders and told to pray instead of seeking medical treatment. FGM and honour-based violence were being dismissed as "cultural", while in fact polygamist and temporary marriages were Islamic practises, she said. There is a slippery road from this to child marriage, and there should be "no space" in the UK for these practises, she argued. "Great powers within the community" were holding women back, and low rates of Muslim female employment could not be attributed entirely to discrimination by employers. I'm particularly pleased that this afternoon we have a secularist who is also a Muslim to present our prizes. She is living proof that secularism and Muslims can co-exist if given half a chance and co-founded British Muslims for Secular Democracy in 2006. Mr Sanderson described how secularism protected the rights of all and said it and democracy were "interdependent". The thing I find interesting and frightening at the moment is when I talk to young Muslims is how little they understand what secularism means. She said the Society's most important work was in explaining what secularism meant for young people, particularly Muslims, and demonstrate that secularism was not atheism. She warned of the growth of Muslim "exceptionalism" and that "universalism needs to be promoted." The Society was joined at the central London lunch event by previous winners of the prize including Maryam Namazie, who was the inaugural Secularist of the Year back in 2005. Peter Tatchell, who won the prize on 2012 also attended. Turkish parliamentarian and 2014 Secularist of the Year Safak Pavey was unable to join the Society, but sent a message to attendees: "I wish I could be with you but we have the critical referendum approaching and we are very busy with the campaign. Each and every one of your shortlisted nominees is a very distinguished members of the secular society without borders. "I wholeheartedly thank all of them for their courageous and precious contributions in defence and support of secularism and congratulate this year's Secularist while looking forward to work together for our shared cause." Mr Sanderson praised her for working in "increasingly dangerous" circumstances to resist the Islamisation of Turkey. 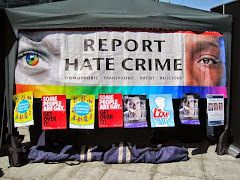 Other campaigners were thanked for their work and Terry singled out Dr Steven Kettell, who was shortlisted for the prize, for his "excellent response" to the Commission on Religion and Belief in Public which had advocated expanding many religious privileges. Mr Sanderson thanked Dr Kettell for pointing out the many injustices that CORAB's recommendations would have introduced, in his "excellent" report. Scott Moore, the founder of Let Pupils Choose, was thanked for his campaign work. He said that, as an 18 year old, he had been campaigning for his entire adult life to separate religion and state, after religion was forced on him and taught as "absolute fact" during his childhood. He said the education system in Northern Ireland "robbed" pupils of their religious freedom. 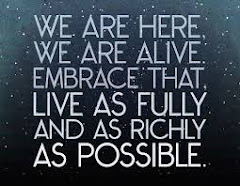 "All belief systems should be treated equally, but they are not." He was applauded for his hard-fought campaign work and Mr Sanderson said Moore gave him "hope for the future." Nominee Houzan Mahmoud spoke powerfully about the importance of universal rights and freedoms. Barry Duke, editor of the Freethinker, was given a lifetime achievement award for his commitment to free speech, LGBT rights and equality and resistance to censorship in apartheid South Africa. The Society's volunteer of the year was named, Sven Klinge, and thanked for the many occasions on which he has photographed NSS events.